The lights from Smiley Happy Christmas were stamped with Memento ink and colored with Copics. I stamped the sentiments with Versafine ink. I also made a Start to Finish video on it that I’ll share on the YNS Blog for Whatcha Watching? Wednesday (I’m having a little trouble uploading it to YouTube tonight). I hope you like my card and TFL! Hi all! This is a day early, but I hope everybody celebrating it has a Happy Thanksgiving! And I also wanted to say that I am thankful for you – my blog readers!! Thanks for spending a little of your day with me and for all your sweet comments!! I used the Thankful Turkey set from Neat and Tangled and Sketch #86 from Papertake Weekly – Take your pick! I stamped the turkey with Memento ink and colored with Copics. The sentiment was stamped with Versafine ink. This is also for the Little Tangles challenge – Giving Thanks. I hope you like it and TFL! I printed the image Christmas Party on my B&W laser printer and colored with Prismacolor pencils. The hello is from the Scripty Words die set, the Christmas is from Jolly and Merry and the striped border is from Basic Borders. Hi all! I’m here with a card using a Simply B Stamps image today. I found Simply B a long time ago and actually bought/used a couple images and then for some reason, she totally fell off my radar. Recently I became reacquainted with her and have since bought a bunch of new images and will be using them more often, so I hope you like them! I printed Rio out and colored her with Copics. Next I cut out the Rio portion with a Papertrey wreath die. I also cut the wreath out of white glitter cardstock and colored it green with Copics. Then I inlaid the Rio into the wreath and taped it together on the back. Finally I printed the sentiment on the card and attached the Rio wreath with foam tape. The sketch is from CASE(E) this Sketch. I hope you like it and TFL! I used the Ugly Sweater stamp set and also the matching dies. Isn’t that sentiment just too funny?! I have 2 techniques to share here: stamping on felt and coloring on felt with Copics. I used Brilliance Ink to stamp the sweater and let it dry. Then I lightly dabbed on the color with the tips of the Copics. Don’t press down too hard or the marker will soak into the felt and go outside the lines. BTW - I used the sketch from Freshly Made Sketches. Please check out the YNS Blog to see all the Feature Day creations from the DT and comment for your chance to win! TFL! I used the Thanks word die and Many Thanks stamp set from Paper Smooches. For the thanks, I cut it out of white cardstock 3 times and colored each with a rainbow of Copic markers (this was to make sure even the edges of the die cuts were colored). Then I glued them together, coated them with Glossy Accents, and sprinkled a little ultra fine glitter over them. I used several ME sets to make this card. The flag banner is from Soiree, the border is from Basic Borders, and the sentiment is from Remember December. This is also for CASology – cue word Flag. I hope you like it and TFL! HI all! Today I have a shaped card for you – yay! I love shaped cards and they’re so easy to make with Make-The-Cut software and my Zing electronic cutter!! I created the card base in MTC and then cut the kraft cardstock and striped patterned paper with my Zing. I stamped the penguins and hats from Arctic Penguins, colored them with Copics, and cut them with the matching Creative Cuts. I adhered the penguins and hats to the base and stamped the little lines next to the top right penguin (love those!!). This is for the ME November Challenge – Holiday cards and tags. I hope you like it and TFL! Hi all! I colored this image from Aurora Wings a long time ago, but I just made it into a card now. I love to look at people’s super fancy embellished cards (you know, the kinds with roses, lace, frantage, ribbons, die cuts hanging off the edges, etc. ), but I just can’t do it myself. This is as fancy as I go! lol! I printed Big Eye Elf with Roses and colored her with Prismacolor pencils and then dotted on Liquid Pearls to finish it off. I added some tulle and a little ribbon bow and called it a day. I haven’t added a sentiment so that I can figure out what to do with it later. Oh yeah, the white highlights were done with a white Sharpie paint pen. This is my second entry into the Aurora Wings FB November 2014 contest – My Favorite Aurora Wings Digi. She really is one of my faves, not only because she’s just gorgeous, but because I’m so proud of how I colored her! This is also for the Aurora Wings challenge blog – anything goes. I hope you like it and TFL! I printed the image Christmas Tree Sprite from Aurora Wings, and colored him Copics (all the skin) and Prismacolor pencils (all the rest). Aurora Wings FB November 2014 contest – My Favorite AW Digi. I absolutely ADORE all the AW sprites and couldn’t possibly pick a fave so this little guy is representing my entire collection of AW sprites! We’d love to have you YNS fans join in on the fun! You can click the picture for more information. I used the Snow Day stamp set from Lawn Fawn and the matching lawn cuts (dies). I sponged the background with Peacock Feathers Distress Ink and then used a stencil and modeling paste to add the stars. I then cut some glitter cardstock with a not-yet-released die from Your Next Stamp and added it at the bottom. The tree was stamped on white cardstock and paper pieced and the bunny was stamped and colored a little with Copics. The strip at the bottom is from the Snow Day paper pad. I used the Folk Art Medallion set that I won from Waltzingmouse Stamps (thanks again, Claire!!). I cut a white tag using a Tim Holtz die and a scrap of red cardstock. The images on the red were embossed in white and the red on the white tag is Stampin’ Up! Real Red ink. I finished off the tag with a little bit of white twill. This is also for Little Red Wagon – monochromatic. I hope you like it and TFL! It looks a little weird because it looks nice and bright silver where the light hit it, and dull grey where the light wasn’t so bright. Sorry! I used the new Holiday Cheers stamp set with the matching dies, the Scribbled Alphabet, and the Heart Doily dies. I filmed a start to finish video on it too! This is also for CASology – Festive. Don’t forget to check out the YNS Blog for more inspiration and all you need to know about the challenge! TFL! I used the super adorable Snow Day stamp set from Lawn Fawn, and the matching dies. The bunnies were colored with Copics and the heart is a solid stamp that I did in red ink. The snow mounds were cut with a Mama Elephant die and the large stitched rectangle die is from Blueprints 15 from MFT. I hope you like it and TFL! Hi all! Welcome to my stop in the November Your Next Stamp New Release Hop! You should have come from Deborah’s blog, but if you just happened across this post, please go back to Brianna’s blog (links at bottom) because you won’t want to miss a stop in our hop! We are so excited for this release! It’s full of super fun and cute Winter/Christmas stamps and dies!! My favorite set has got to be the Sweet Holiday Greetings stamp set with matching dies (I do love matching dies! ), but I’m also completely smitten with the Gingerbread House Die Set – SO much fun!! Anyway, enough chatter – let’s get on with the show! The sketch is from the Sweet Sunday Sketch and the papers are super old ones from my stash. I colored both of them with Copics and cut them out with their matching dies. As always, we have a Hop prize: one grand prize winner will get a $20 YNS gift certificate!! To qualify for the grand prize, you must leave a comment on all the DT Blogs. 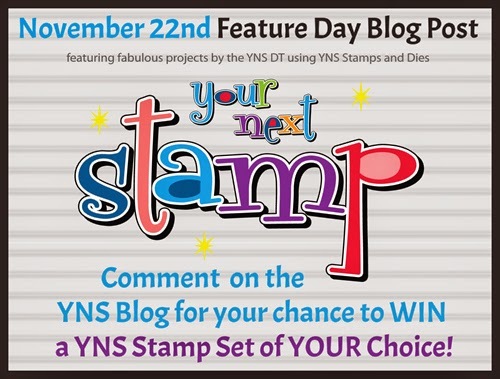 Karen will post the winner on the YNS blog on Nov 12th. So now you’re off to Angel’s blog, but don’t forget to leave a comment before you go! Happy hopping and good luck! I decided to dig into my super stash of Project Life cards and found these sweet ones in the Dear Lizzy Mini Edition. I used the one that had Smile at the top, the one with the french text, the pink with the polka dots and the yellow zigzag. The cupcake is from Carnival Cupcakes and the sentiment is from Carnival Toppers. This is also for Crazy 4 Challenges – include numbers on your creations (see those little scrabble-like letters at the top?). I hope you like it and TFL! Every die (except the snowy hill die) I used is from the Gingerbread House die set! I did a Google Image search for Gingerbread Houses for inspiration and decided to make it pink! The snowy parts on the roof and chimney were cut from glitter cardstock and colored with the chisel tip of a Copic marker. The lights and wreath were also colored with Copics and I added some Glossy Accents to the lights. The rest of the pieces were die cut from pink or brown cardstock. I cut a little scrap of black to back the gingerbread girl. The sentiment looks a little funny in this shot because I stamped the sentiment directly on the glittered cardstock. This is also for Little Red Wagon – Home is where the heart is, and Delightful Challenges – include patterned paper. Please go over to the YNS Blog to see all the designers who have peeks for you today. And then I hope to see you back tomorrow for the hop! I used the Party Posse stamp set and Posse Icons dies, He Said, She Said for the thought bubble, and Quirky Animals Set Two for the sentiment. I mirrored the hamster at the top by stamping on vellum and turning the vellum around. I did some die cutting with a couple Blueprints dies and popped up the images with foam dots. I used the AW Strawberry Sprite and a sentiment from Whimsy Stamps’ Feeling Fruity set. She was printed on watercolor paper with my Epson inkjet printer and watercolored with Inktense pencils. This is for the Aurora Wings challenge – Heartfelt Thanks. I hope you like it and TFL! I used the ADFD image called Little Winter Fairy and a sentiment from Paper Smooches. The image was printed directly on the kraft cardstock with my laser printer (manual feed and using the special exit out of the back of the printer) and colored with colored pencils. Then I added a little Stickles on the wings. I hope you like it and TFL! I used the penguin from Chilly Chums, the hat from Chubby Chum Pals, and a sentiment from Joyful Greetings. The penguin was stamped in Memento black ink then colored with Copics. To give him a cleaner, blacker look, I overstamped him exactly with Versafine Onyx Black ink. I fussy cut out the Santa hat and adhered it with foam tape. The whole penguin circle was also attached with foam tape. Finally I added some large googly eyes for fun!